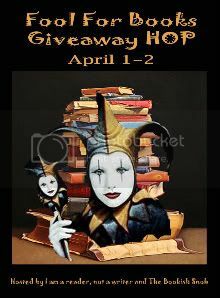 There are so many blogs participating in the Fool For Books Giveaway Hop. You will find some nice book related items being given away. There is a linky at the end of this post. After you've entered here, hop on over to the next blog on the list and keep going as long as you'd like! The more you enter, the more likely you are to win. Good luck! I am giving away to one lucky follower a collection of lovely items that you will enjoy. Acrylic Cookbook Holder- To help you in the kitchen. The Ultimate Guide to the Daniel Fast- A collection of recipes and inspiration. The Mead Shopping Companion- To help you organize your shopping trip. The Life Ready Woman (Thriving in a Do-It-All World)- To help you in your busy day. Words of Wisdom- Quotations that can be used daily. 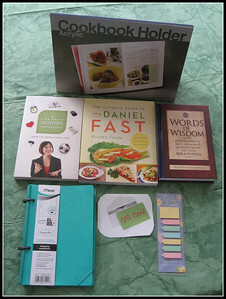 Book Mark with stickies- To mark all of your favorite recipes. A $10.00 Gift Card- Your choice of either an Amazon.com or Barnes and Noble Gift card. Main Entry- US and Canada only. 2. 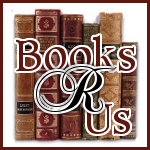 Follow Books R Us on Facebook. 3. Subscribe to Ginger High- Books R Us by Email. Must be verified to count. Winner will have 48 hours to respond to the email or a new winner will be chosen. Giveaway ends 4/2/2011 at 11:59 PM Eastern. Hi Melissa! Stopping in to show some blog love from the Pitch List :) Congrats on publishing a book before you even finish high school! You (and your mom) must be very proud :) I have a daughter that is a Freshman in high school. Looking forward to learning more about you and your blog! Fellow Boost your Buzz Sponsor Visiting from Mom to Bed by 8! Stopping in to say hi :) I hope you had a great weekend!